Astronauts Sent Whiskey, But Even Without Gravity They Can't Raise A Glass : The Two-Way A Japanese company sent liquor samples to the International Space Station. Unfortunately for the astronauts, they won't be able to celebrate the arrival of the stash with a toast. 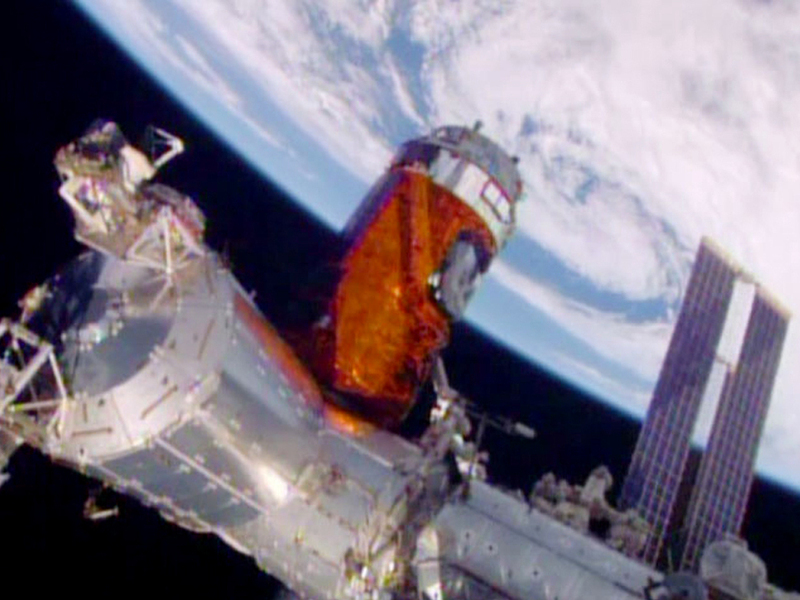 In a photo provided by NASA, a cargo ship from a Japanese company is bolted into place on the International Space Station. Astronauts aboard the International Space Station received a shipment that included whiskey on Monday but they won't be allowed even a taste test. Japan sent up a cargo ship with nearly 10,000 pounds of much needed supplies. Among the goods was whiskey and other alcoholic beverages made by a Japanese company. "The station's big robotic arm — operated by Japanese astronaut Kimiya Yui — grabbed onto the supply craft launched Wednesday by his homeland. Flight controllers helped anchor it down." The reason behind Tokyo's Suntory Global Innovation Center sending their products up into orbit is to see if spirits "mellow" the same way in space as it does back on Earth. Unfortunately for the astronauts though, they won't be able to celebrate the arrival of their stash with a toast. "[The] astronauts will not crack open a bottle to celebrate the freighter's arrival; the liquor is flying for purely scientific purposes. Suntory plans to conduct future experiments to see how the "mellowness" of spirits is affected by microgravity and a lack of convection (the flow of heat through a liquid or gas)." The liquor samples will stay on the Space Station for a year or two. When they return to earth, they'll be compared to samples that stayed on earth, to see if they have mellowed. So the spacemen will have to figure out another way to recreate this popular ode to throwing back the hard stuff.